Mary Ann Dunn was born at Nyngan on 11 September 1874, daughter of Michael Smith and Mary nee Reece. In 1896 she married William Henry Dunn at Nyngan. She died at Glebe on 15 August 1944, aged 69 years. William Dunn died 24 April 1951, aged 80 years. There were five children of the marriage: Arnold, Cyril, Hilton, Mary and Kathleen. A feature of domestic life before World War 2 was that a high percentage of married women did not work outside the home, and Mary Ann Dunn followed that convention. Her occupational status was given as home duties. Husband William was a foreman. The first woman elected to Glebe Council in 1932, Mary Ann Dunn was an active anti-conscriptionist in 1916 and 1917. An outstanding organiser, she was secretary of the Timberworker’ Relief Fund in the 1929 timber strike where local networks ensured striking workers and their families received food and shelter for more than eight months. Glebe Council placed a lorry and a driver at her disposal to this end. A strong and influential figure, Dunn was an important member of the Glebe branch of the ALP, and of Glebe Council (1932-37). She was also the Glebe ALP representative on the West Sydney Electoral Council. Mary Ann Dunn was the first female alderman on Glebe Council. She served from 1932 to 1937. She gave evidence to the Royal Commission on the Basic Wage in 1920. 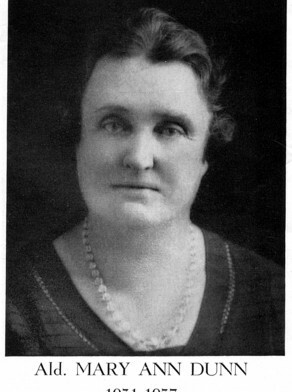 At the 1932 municipal elections Dunn was the only woman elected to local government in NSW. She was a prominent member of the ALP’s Women’s Organising committee. In 1937 Dunn expressed her disapproval of Mayor Foley’s direction to Glebe Council employees to demolish turnstiles and ticket boxes at Harold Park regarded as a barrier across a public street. She stood as a State Labour candidate for Glebe in December 1937 but was not successful.